Do you have one or more cards with debt over $7500K, high interest rates, creditors calling you, and you're barely paying the minimum? Debt Burst are credit card debt management counselors and debt management professionals who assist people like you who are looking for a way to reduce their payments while enjoying a stress-free life and eventually paying off their debt completely. A credit card debt management service streamlines your monthly payments into one, and takes the pressure off you by making your monthly creditor payments for you. It simplifies the process and makes paying off your bills easy. If you're in enough financial hardship to qualify for a debt management plan, you definitely belong in a consumer benefits program which offers deep discounts on thousands of name-brand products and services. 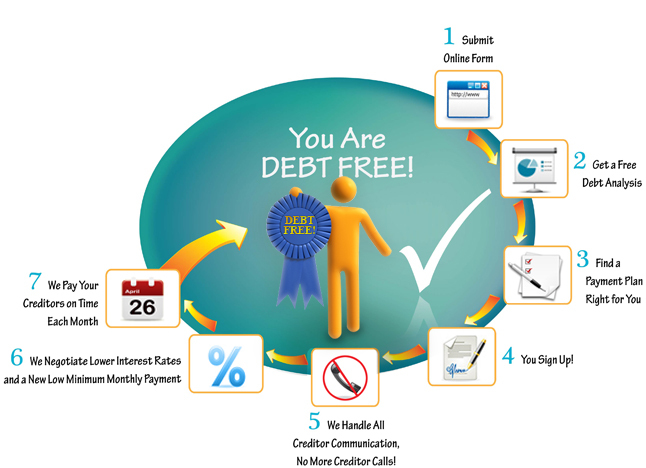 We also offer credit management services, credit counseling services and credit card relief program. Find out what your debt management/credit card debt management options are compared to other choices out there. See how Debt Burst's advanced debt solution compares and saves you money. Also, you can fill out our easy-to-use interactive debt calculator to get a snapshot of what you could possibly save using Debt Burst. We are here to help you so contact us today!